I bought the lovely cat meditation ball you can see in the photo on the right when I was at Witchfest last week - it seemed to call to me and even though I was trying to be a bit frugal with money I couldn't resist buying it. It is a handcrafted totem orb made by artist Yve Sturgeon and was just one of a range of meditation balls on her stall. Others depicted animals including badgers, butterflies, crows, deer, dogs, hares, hedgehogs and owls. She also makes other orbs showing flowers and people. Each one is individually sculpted from a type of fine plaster and then waxed. They are designed as a aid to meditation. Totem Orbs: Over the ages mankind has used meditation as a step towards achieving a special state of grace. In the practice of meditation ancients focussed on personal totems or emblems, it was often a creature that encompassed qualities most admired or desired. These totems were to be seen and touched as an aid to help keep in tune with the natural rhythms of life. 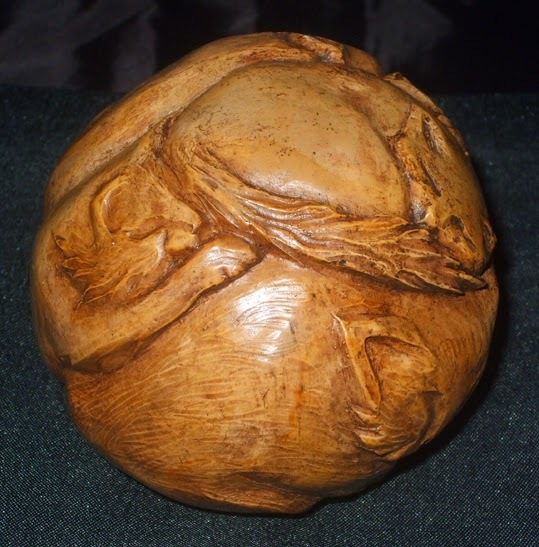 These handcrafted nature balls, round like our planet, are carved with animals we know and love, and are made to be touched. Cats can see in the dark, showing us to manage our fear of the unknown with dignity. An ancient guardian of the temple, the cat teaches us to relax and enjoy life. One of the reasons I bought my cat orb was as a memorial to my own feline friend who died recently. The day after Witchfest I performed a requiem rite for my cat, lighting a candle for him and placing it in my cauldron, then saying a few words to wish him safe passage into whatever might lie beyond the veil of life. 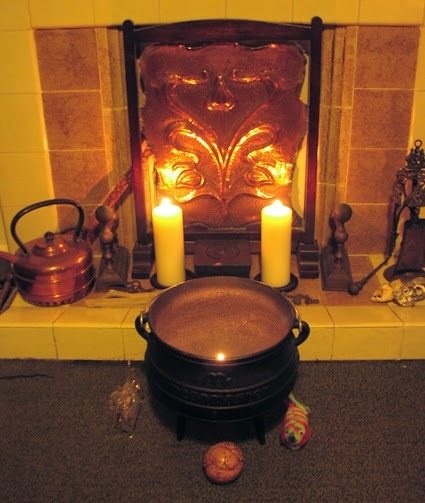 I placed the orb in front of the cauldron, and at the sides I put one of his favourite toys and a cat ornament a fellow witch had given me as a gift. But I think the meditation ball has a further message for me. I have to go into hospital some time in the next few weeks for a procedure - although it is a pretty minor thing as hospital treatment goes, I am nervous about it. Holding the cat orb and meditating on its message will hopefully teach me to relax, live in the moment, and lose my fear of the unknown that lies ahead. Hoping all goes well with you in hospital.